What a week this is as events unfold. Pro Alien Party announced flooding in 30% more people to squeeze with stressed up sillyporeans on this already congested tiny island. Sillyporeans are asking is the Pro Alien Party mad to have 6.9M people. 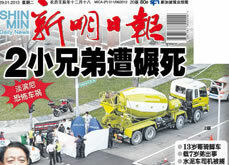 Then 2 kids are killed by a cement truck while riding a bicycle. I don't know if the cement truck is speeding or didn't see the kids at the vehicle's blind spot. Then today there is an accident in the morning involving 2 buses that resulted in a massive jam at 3 expressways. Kiasu(scared lose) habits + fast pace of life + stress already result in such a scenario. It'll be even worse with 6.9M. People question the quality of life with 30% more people squeezed in. As a cyclist myself i also get scared with the notion of increased accidents with more stressful, emotionless, unhappiest people driving around.